This pair of blue glass lamps are by L. E. Smith Company (Mt. 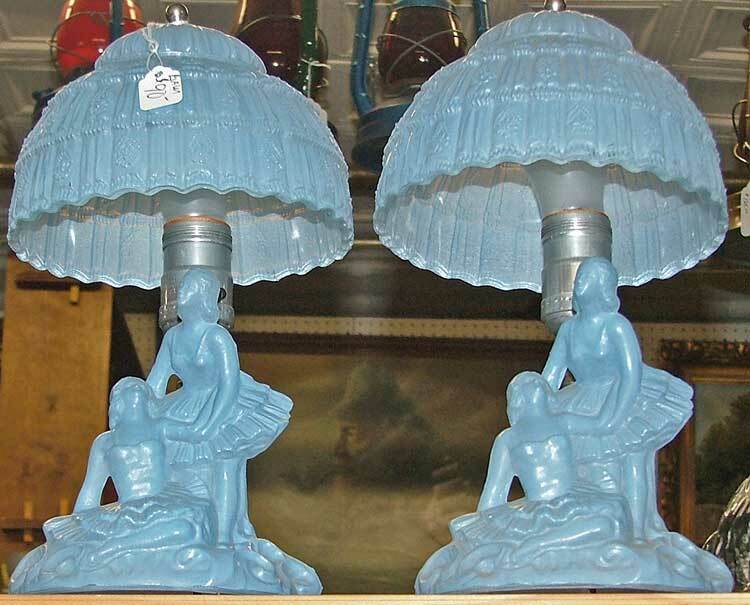 Pleasant, PA) and feature two ballerinas on each lamps with a beautifully detailed blue glass lampshade. They stand about a foot tall. Any ballerina (young or old) would love these exquisite lamps. The L. E. Glass Company has a most amazing history. CLICK ON THIS LINK for just one perspective. (Please note the company and the museum are no longer in operation.) There is also a most interesting book: L.E. Smith Glass Company: The First One Hundred Years by Tom Felt and published in 2007 available at AMAZON. We hope you’ll stop in soon and check out these beautiful lamps. Someone you know may love them as a gift. We’ll be watchin’ for ya.